If you're intrigued by Kokopelli, then you'll love this delightfully whimsical piece of Kokopelli wall art - The Dancing Kokopelli. A complement to your rustic or southwest home decor, this metal Kokopelli can be mounted on your front door or used as an accent piece inside your home. These unique designs communicate the true meaning of Kokopelli symbol: that which brings you joy in life. Each Kokopelli wall art piece is signed by the artist. 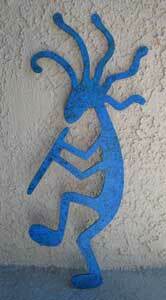 Kokopelli metal art is made of 14 gauge metal and finished by an artist. Since each piece is finished individually, finish may vary. 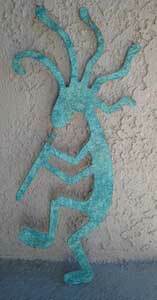 The Dancing Kokopelli measures 16 inches high and sells for $40.00. Order your Kokopelli wall art today. Your satisfaction is guaranteed.